Below is the painting and text of one of the creatures in my ongoing project, Extinct & Almost Extinct: 50 Paintings. Coral organisms or polyps are tiny soft-bodied sea creatures related to jellyfish. At their base the creatures build a hard, protective limestone skeleton of by secreting calcium carbonate. They divide into many thousands of clones forming coral reefs. These colonies grow over hundreds, even thousands of years. Some of todays coral reefs may have begun growing 50 million years ago. The vivid color of many corals come not from the coral polyps themselves but from the colorful algae that the corals host on their surface. Elkhorn coral are found in the Caribbean Sea and gained their name from their large antler-like branches. They primarily reproduce when branches break off and reattach to the substrate. Sexual reproduction does take place annually but few larvae survive. Elkhorn coral are fast growing with branching increasing 2-4 inches a year gaining maximum size and up to twelve feet in diameter in 10-12 years. Most colonies are found in reefs of less than 20 feet deep but some have been found in depths over 60 feet. 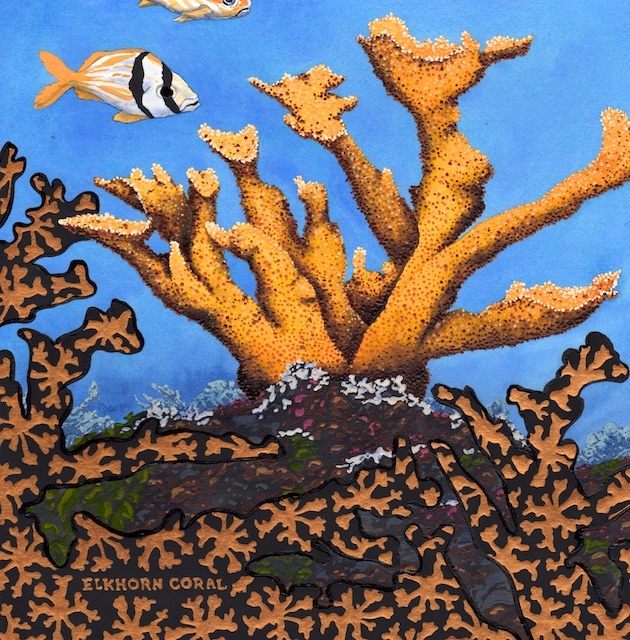 Elkhorn coral were once the most common coral in the Caribbean Sea, sometimes called the “redwoods of the reef.” Since the 1980’s the population of these corals has been reduced by 80-98%. The cause of the drastic reduction has been disease, climate change, and other human factors that has brought the species to near extinction. The warming of the waters has made the species more susceptible to a disease called white pox where the warm temperatures cause the coral to expel their algae symbionts and the coral polyps often die. While coral reefs cover only 1% of the ocean floor they support nearly 25% of the ocean’s creatures. It is feared that a combination of climate change, pollution and sedimentation could kill 30% of the world’s existing reefs in the next 30 years.